RUSH: Look, folks, do not misunderstand me here. I'm not trying to be Debbie Downer about anything. Quite the opposite. Let me analogize it this way for you. During the past 30 years -- and I only cite the 30 years because it's a lot of experience. I wouldn't be able to do the program I'm doing today or yesterday or last week 30 years ago. I did not have the experience, the data. I had not acquired enough knowledge and had enough experiences to be able to relate it to things. So it's a great benefit to have been able to do this. During these past 30 years, I have been a target of Republican women wherever I go, be it socially or at political events -- and in some cases, their husbands and Republican men. They have approached me and told me that I have to get the party to stop talking about abortion, that it's killing us. Now, don't have a knee-jerk reaction and tune out here. This has a point. They would tell me, "We're losing elections because we have a Christian or Religious Right position on abortion, and we're targeting ourselves. We just have to forget it. We are fiscal conservatives, but we've got to stop this conservative social issue stuff because it's killing us," and for all the reasons that we've talked about. I mean, the men were being henpecked by their wives to shut up about it, and Republicans at large didn't like thinking they are at the same party with the Religious Right and so forth. Whenever it happened, whenever I was targeted... It happened a lot of places. I'd go see the crew for Sunday Night Football and we'd be in a van on the way to dinner. And if it happened to be a Sunday night after an election, boy, would they unload on me. If the Republicans had lost, they would unload! "You gotta get rid of abortion! You gotta..." And every time it happened -- be it on a golf course, I don't care where -- I would say to them, "If we don't get a handle on this, it's gonna get to the point someday where we're gonna be killing anybody who is inconvenient, not just babies. If we don't stand up for life... You've gotta stop looking at this as some sort of Religious Right issue and thinking you can't be part of it because you don't want to be lumped in with a bunch of Christians or a bunch of religious zealots in your mind. "This is about the fundamental thing we all only have one of, and it's a life, and we have a political party which is pushing every day for the right to kill whoever they think is inconvenient -- and they're gonna do it one way or the other. They're gonna do it with law. They're gonna do it with health care," and every time I would point this out, they would pooh-pooh me and say that I was being paranoid and irrational, and abortion was a standalone issue that didn't have any growth features. It just was what it was. I went hoarse trying to tell them that this wasn't the end of anything, that it was like everything else in liberalism is: The beginning. But the problem I was up against was that even these educated -- very wealthy, in some cases; in other cases well-to-do -- people, they didn't have a concept of liberalism. To them, everything was Republican versus Democrat. To them, everything was the Religious Right versus everybody else. To them, everything was fiscal conservatism, social liberalism, what have you. And they were immune. I could not find a way to get through to them and tell them that this was not just about babies and women's rights to choose and all this. It was about what kind of country we were eventually gonna have. If these people who revel, who celebrate the right to kill little children... If those people continue to gain power and don't pay a price for that.... But I got nowhere. I frustratingly got nowhere, because what overpowered my attempt to persuade them was the fact that they were embarrassed or humiliated to be in a party that made abortion such a big deal. They were fine with reading the Wall Street Journal and being fiscal conservatives and all that, but they wanted no part of anything to do with social conservative issues. They didn't want to hear about any culture war. To them... See, they were well enough off that they could avoid it if they wanted to, but it was not just that. They weren't even thinking. To them, it was all party politics. There was no ideology whatsoever. They didn't understand that Democrats were liberals, were socialists, were communists, budding communists. They didn't care to understand that. \Which is why I have been so hell-bent in my belief that the real education that needs to take place in this country is helping people to understand who liberals are and then what that means. Because if we had done that, if we had succeeded, if we hadn't run away on the abortion issue, if we hadn't run away from the culture war, if we hadn't run away from that, then... If we had properly educated people -- everybody, not just kids. If we had educated a significant number of people that it is Marxism, that liberalism is what led to Nazism, that liberalism is what led to the Soviet Union, that liberalism is what led to Cuba! 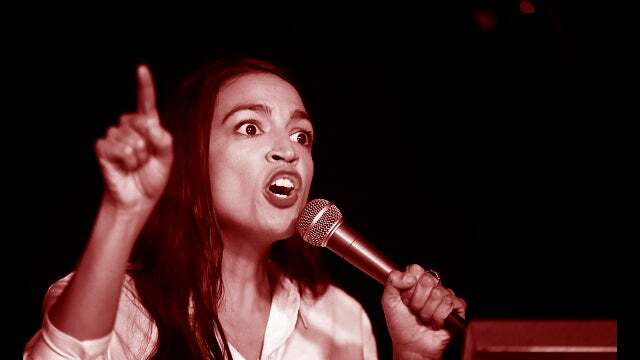 If we had done a good job of educating people that that's what liberalism means, then Cortez and her proposal yesterday would you have been laughed out of the planet and it would have been rejected by everybody as absolute lunacy. But we're not there because we have not done it. And now with the Never Trumpers doing everything they can to destroy Donald Trump, they are joining with these people on the left. Many of them have said they would have voted or did vote for Hillary Clinton, which is like voting for Karl Marx, which is like voting for the socialist government of the Nazis. Not even that phased them, such was there hatred and dislike on a personal level for Donald Trump -- and there again, it was the same thing. They didn't want any part of Donald Trump like the people I'm telling you didn't want any part of abortion. It made them nervous to think they were in the same party with that ogre, with that that brute, with that insult to civility and so forth. So it was impossible to make much headway. Now, we're doing much better in terms of, like, Trump's approval number is at 50% today in Rasmussen. That's straight off the State of the Union speech, and the loyalists that Trump has are indeed loyalists. There is no way that anybody is going to be able to talk them out of their support for Trump. It's one of the reasons why the Democrats are going even crazier and crazier -- and the media is too -- is that they have launched everything they've got at Trump. They have put to play every weapon in their arsenal, and it's been like spitting spitballs at a battleship. It just hasn't even made a dent. That's made 'em even more frustrated than they ever thought they would be. So now part of this Green New Deal and related socialist proposals is in reaction to Trump. I can't tell you how crazy they were driven on Tuesday night at State of the Union speech which I (sigh) have got to get to too. There's a fascinating story about how massive Trump's support is among women in this country. But you wouldn't believe that, would you? I say that, and you probably think, "Rush, women hate Trump. I -- I -- I've seen it in the media. I've seen it on TV." They don't hate Donald Trump. I'm not talking about just female Trump supporters. I'm talking about surveys of women at large, the overall American population. So I failed in trying to tell people that if we didn't get a handle on educating people, where we were headed. If we can, as a society, lose so rapidly the respect and the reverence and the awe for the sanctity of life, then nothing is safe. But they thought I was the kook, and now abortion after birth gets a standing ovation in New York -- and all I'm telling you is the same thing has been happening on this climate change issue. Climate change from the left is about much more than pollution. It's about much more than saving the planet. It's about much more than getting rid of jets. It's about communism. It's about socialism. It is about tyranny and totalitarianism. And it's right there in front of us now. And people are laughing at it instead of taking it seriously as something that needs to be seriously, stridently opposed. So that's the solution. The solution to this is to wake people up about who liberals really are, what they really are, what they intend to do. And we don't have to theorize anymore and we don't have to predict because they're doing it every day. They're letting it be known who they are and what they want to do. The challenge is to get people not to laugh at it first, to laugh at it second or third, but to take it seriously and work very hard at convincing as many people as possible that what they are proposing -- to say it's impossible is the wrong way to go about it 'cause that's not stopping them. What has to be done is the American people have to be told what their lives are going to if these people even get half of this. RUSH: Here's Sam in San Diego as we head back to the phones on Open Line Friday. Hi, Sam. How are you? CALLER: I'm doing well, Rush. Thank you. So I had a thought here. You know, reading about the Green New Deal and Ocasio-Cortez, and I was thinking the number one way to fight socialism is we have to raise the cost of borrowing. And part of what's causing the problem in my opinion -- and I'd love your reaction to it -- is that cheap money and easy credit is driving a lot of these kind of no consequence promises where it's gonna get paid for sometime in the future, but it doesn't really take into account the cost of borrowing. And I think while that might cause a shock to the system, it could be good in kind of reminding people that everything has a cost. So I'm interested in your thoughts. RUSH: Well, you are, of course, correct, sensible, and very reasonable and in suggesting that there's a consequence for action, a consequence for borrowing too much money, a consequence for borrowing money that you can't pay back. But unfortunately your reasonableness and your sensibilities here are irrelevant. To hear them talk, they're not even talking about borrowing money, Sam. They're talking about, A, taxing it from all the rich people. This woman even thinks that Goldman Sachs is Trump's number one campaign donor. They donated to Hillary. And then the next thing they're talking about is printing money, if there isn't enough. They're not gonna borrow anything. They're just gonna print it. Whatever they need, they're gonna have it. RUSH: I mentioned this at the top of the program. Here's the backup for it. Oregon senator... I mistakenly called him a congressman, representative. Senator Jeff Merkley, Democrat, Oregon, on Wednesday, defended socialism against President Trump . You know, in the Trump State of the Union he pledged the United States will never, ever be a socialist nation. Jeff Merkley... He said the same thing when he came out supporting Alexandria Ocasio-Cortez's new green deal, Green New Deal, green-with-envy deal, whatever. He said (summarized), "Socialism is fine. Socialism is society coming together to increase the standard of living of our seniors." Now, this guy's a United States senator. He was on CNN's Erin Burnett OutFront (and In Behind). It was on Wednesday. He defended socialism from Trump's criticism. He defined socialism as "a society coming together to increase the standard of living for our seniors." How do you think they arrive at Medicare for all? "It's good. It's socialism!" Folks, this is another thing we're up against. You know how many young people...? I have people my age who have Millennial children, and they're pulling their hair out. Their kids don't know what socialism is. They have an entirely different understanding of it. It has not been properly taught. Socialism has been romanticized, and socialism basically means everybody is cared for and everybody is content and nobody has much more than anybody else and nobody really wants for anything -- and that's the extent of it. That's how socialism has been presented. Socialism has not been presented as Marxism. Honest to God, my first reaction was: "What have we done to these people? What have we done to these kids? What disservice have we visited upon them by making them so stupid?" They really have not been given a quality, competent, responsible education about much of anything. 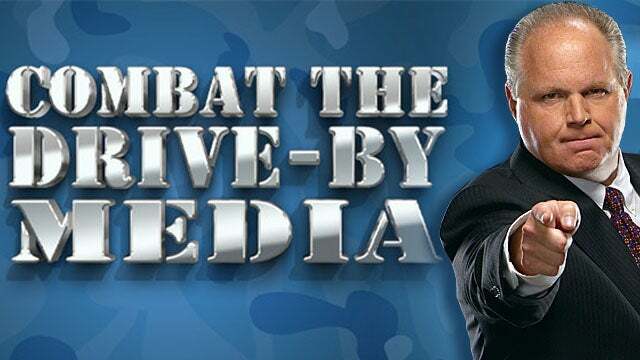 What they have is a propagandized and indoctrinated set of believes that equal an agenda, and the foundation of that is rage and anger. When I was growing up, everybody knew what socialism was, and nobody wanted any part of it. Well, I can't say nobody. I mean, it has always had its people that believe it would work if the right people were behind it. What do you think it meant when Obama was running around saying, "We are the ones we've been waiting for"? What that meant was, "We're the ones to make collectivism work! We're the ones gonna make socialism work. We're the ones that are finally gonna do it right." Stop and think about something, folks. There's not a single... In all of human history, there's not a single success story to which you can point, socialism or communism, and yet look how romanticized the belief in it is, particularly among young people. Again, we've been warning about the education system and people have been taking their kids out of it. Homeschooling, for example, had been a result of it. But at some point, there's gonna have to be an uprising and these people are gonna have to defeated. Not tolerated and not accommodated and not patted on the head and told, "Aren't you cute? Isn't it funny what you believe?" They're gonna have to be resoundingly gobsmacked. They are gonna have to be obliterated politically. They are gonna have to wiped out. Otherwise, this creeping growth and believability in all of this is going to continue. 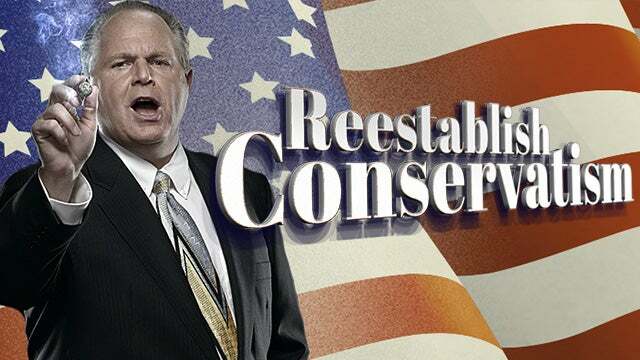 RUSH: I mentioned earlier the Associated Press has tried to present the Green New Deal as if it's perfectly sensible. And in every news source read by young people and Millennials, it's been seen as entirely reasonable, perfectly so. And by doing so they have completely misrepresented it. For instance, the AP claims the plan includes nuclear power as a zero emission energy source. It does not! They are eliminating nuclear power in the Green New Deal. In the Green New Deal, they promised a job for anybody who wants to work or doesn't want to work. By the way, they have deleted that line. They finally realized it didn't quite sound good. They're willing to provide money for people who don't even want to work. The AP omits all kinds of awkward things like the promise of economic security for those unwilling to work. The AP doesn't mention the pledge to get rid of air travel in 10 years. The AP even says, "While setting lofty goals, the plan does not explicitly call for eliminating the use of fossil fuels such as oil and natural gas, a nod to pragmatism." BS! It does not specifically call for getting rid of fossil fuels! And the AP is lying through their teeth here with their little, "A nod to pragmatism." So rather than call these people the dummkopf radicals that they are, they're being called pragmatists here in something that isn't even possible. It is not possible to get rid of air travel and maintain a functioning economy. It is not possible to get rid of fossil fuels -- oil, natural gas. It simply isn't possible. Especially when the rest of the world is gonna be ramping up and using all of this stuff. And we are gonna end up, we would end up being trounced economically. This country would be the biggest soup kitchen. This entire country would be nothing but a gigantic, poverty stricken welfare state if these people ever do get what they want. The AP says, "While setting lofty goals, the plan does not call for the elimination of fossil fuels." The AP even says that one of Alexandria Ocasio-Cortez's talking points, “More than 80 percent of registered voters supported the concept of a Green New Deal in a December poll by Yale and George Mason universities.” Well, maybe, but the poll was taken before they had announced the details of the Green New Deal. Which is part of the trick, by the way. Green New Deal simply means we're gonna stop climate change and all these young people, that's what they want to do, so who could possibly oppose a Green New Deal to save the planet? But this AP story on this Green New Deal and what was said by Ocasio-Cortez, this is blatant media malpractice. The Green New Deal excludes nuclear and would increase emissions, just like it did in Vermont. They tried this in Vermont. They had to shut it down. But here's the thing. Already four Democrat presidential candidates have endorsed it: Spartacus, Fauxcahontas, Kamala Harris, and Kirsten Gillibrand. They've all endorsed it, whether they've seen it or not. 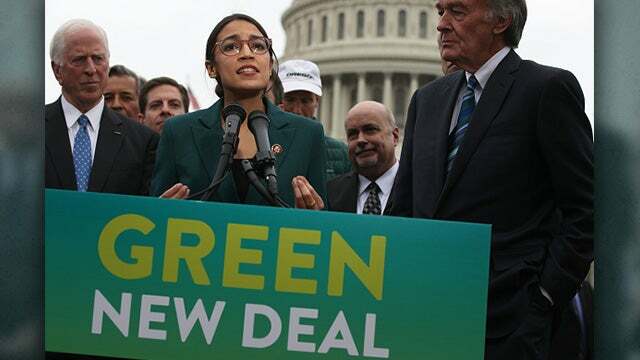 “Green New Deal Demands 'Economic Security' for Americans 'Unwilling to Work.’” As I say, they've had to pull that one down. But they nevertheless intend it. Then she went on to say that Goldman Sachs has been one of the leading corrupt donors of Donald Trump. Well, Goldman Sachs is who paid Hillary 250 grand per speech for a 20 minute speech! Goldman Sachs and practically all of Wall Street was all-in on Hillary Clinton, not Donald Trump. Wall Street was actively arrayed against Donald Trump. Hillary Clinton was the largest single recipient of Goldman Sachs-affiliated donations. Trump's campaign was way down the list behind not only Clinton's campaign, but behind Steny Hoyer of Maryland, Tim Kaine, Virginia, Kyrsten Sinema, Arizona. Trump got practical nothing from Goldman Sachs. What they don't know, the things that they don't know but think they are experts in could fill volumes. But the sad thing is that America's socialist-leaning Millennials don't know this, either. They have just swallowed every bit of this hook, line, and sinker.